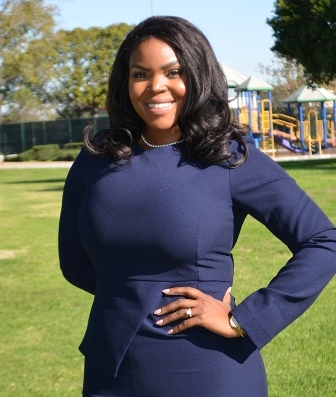 Compton Mayor Aja Brown announced Thursday that she is a Democratic candidate for Congress in California’s 44th District. Brown, made history in 2013 at the age of 31 when she was elected the youngest mayor ever in the city of Compton. A local and national trailblazer, Mayor Brown’s ‘New Vision for Compton’ revitalization strategy has guided improvements in quality of life, economic development and infrastructural growth, policy reform, innovation and strategic partnerships since taking office. Mayor Brown is the recipient of the coveted 2016 John F. Kennedy New Frontier Award, the 2015 Brave Ones Leadership Award by Leadercast and was the prestigious University of Southern California 2014 Young Alumni Merit Award. She proudly served on the California State Delta Stewardship Council from late 2014 to 2016, a governing body created by legislation to achieve the state mandated coequal goals of providing a more reliable water supply for California and protecting, restoring, and enhancing the Delta ecosystem. She’s led young women and girls empowerment efforts through her partnership with Girls Fly!, a global initiative geared at exposing young women and girls to careers in science, technology, engineering, arts and math. Brown holds a Bachelor’s Degree in Public Policy, Urban Planning and Development, along with a Master’s degree in Urban Planning with a concentration in Economic Development from the University of Southern California. She is married to her best friend of 14 years, Van Brown. The election will be held Nov 6. For more information, please visit JoinAjaBrown.com.